Hawaiian Community Assets 1-866-400-1116 "Building Foundations for Future Generations"
Hawaiian Community Assets is a 501(c)3 nonprofit, HUD-approved housing counseling agency and community lending institution that builds the capacity of low- and moderate-income communities to achieve and sustain economic self-sufficiency with a particular focus on Native Hawaiians. HCA implements a unique, holistic approach to helping families achieve and sustain permanent housing. Named Kahua Waiwai, meaning "Foundation for Wealth," HCA's comprehensive program includes housing and financial education workshops, individualized counseling, and access to asset building services and financial products - all in the context of Native Hawaiian culture. Kahua Waiwai espouses the basic philosophy of "A Sense of Place." The home is viewed as a foundation (Kahua). Upon this foundation is built the family's spiritual values and teachings (Waiwai). It is the spiritual value of the home and its surroundings that provides stability and the opportunity for families to build a secure future. Opportunities that help stabilize family life help to create a more stable community. A strong foundation, if built properly, will serve generations to come. 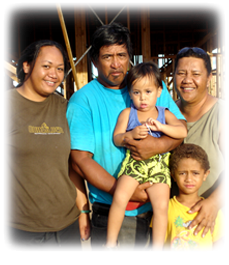 During the 2011 Fiscal Year, HCA expanded its work as a housing counseling agency and community lending institution to address the struggles of our families hit by the ongoing international economic and housing crises. To this end, HCA worked in partnership with other community-based organizations to support nonprofit affordable housing development, housing education and counseling for homeless families living in transitional shelters, and individualized attention for homeowners at-risk of foreclosure.